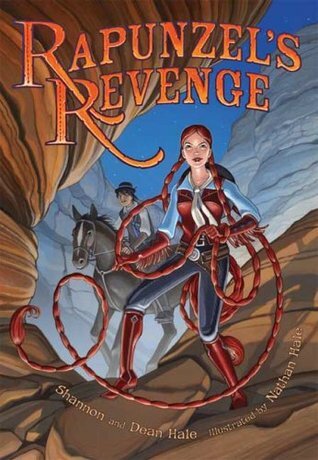 Rapunzel's Revenge is a graphic novel by Shannon and Dean Hale, illustrated by Nathan Hale. It is Wild West adventure adaptation of the fairy tale Rapunzel in the form of a graphic novel and I cannot recommend it enough! Age: It's generally categorised as suitable for 10+ or late Primary School, but I'd definitely recommend it for both younger and older audiences. My family discovered Rapunzel's Revenge around 2010, everyone enjoyed it thoroughly; my mum, me (20), my younger sisters (18, 15, 5). My five year old sister would get us to read it to her repeatedly, all the way through. The illustrations are beautiful, have lots of colour, great details and work together with the words to create the story. Rapunzel is a great example of an active female heroine who subverts fairy tale tropes and is totally loveable and relatable. The male protagonist, Jack, is not belittled, he is valued in a way it does not detract from Rapunzel's value. They do a really good job of balancing a great female protagonist without demeaning the male. It's not all about romance, the story indirectly, and directly, tackles all sorts of issues from control of scarce resources (thank you sister studying economics), the problems with guns, stealing etc. It values people, all people, and challenges the idea that selfishness is necessary to personal happiness. Shannon Hale's website has some great resources. Paper doll pdfs, world map, thoughts on the graphic novel format etc. Calamity Jack is the sequel and equally awesome. Most online book sellers have it, but I'd recommend your local independent bookshop - it's the kind of thing they love, and if they don't have it, would definitely order it for you. Also I think most libraries would have it.